If you ever get bored with your ground beef rotation of recipes, try Instant Pot Picadillo for something different. What, you may ask, is Picadillo? It is similar to hash. It is made with ground beef, tomatoes (tomato sauce may be used as a substitute), and other ingredients that vary by region. It is often served with rice or used as a filling in dishes such as tacos, savory pastries or croquettes. The name comes from the Spanish word picar, which means “to mince” or “to chop”. Thank you Wikipedia, for that concise definition. Now I will tell you mine. It is “What in the heck can I make with this ground beef tonight? I’m bored.” Then you cook that ground beef (ground turkey works well, too) with tomatoes, garlic, onion, green olives (or capers), some seasonings, and even raisins! It’s a hash, so anything goes, and there is no RIGHT way to make this! 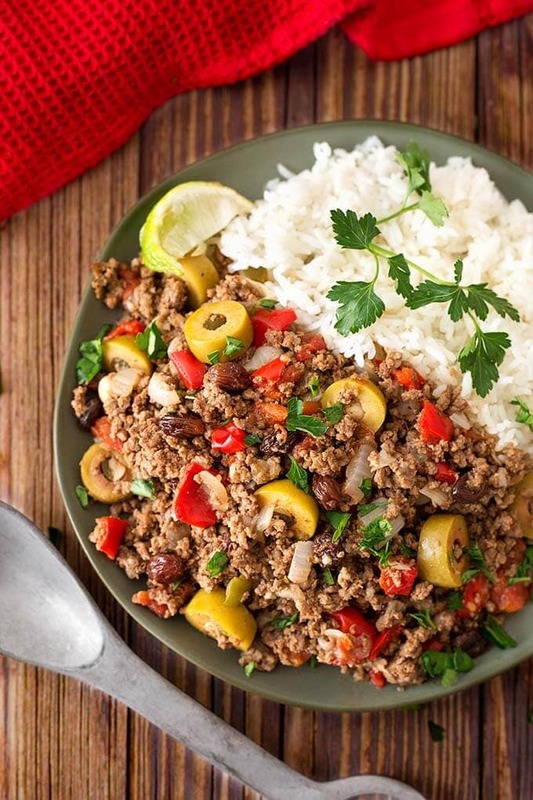 The unexpected flavors of this pressure cooker Picadillo are sure to take you out of the boring ground beef recipes rut. The hints of salty/sweet are really nice! You can use Instant Pot Picadillo as a filling for tacos, burritos, empanadas, or on tostadas. 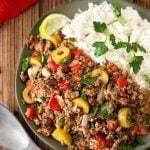 Picadillo is often served over rice, which is a good way to enjoy the juices that develop while cooking. Yum! Instant Pot Picadillo comes together pretty fast, so it works well for a weeknight meal. You can even cook rice in a separate dish in the pot at the same time (Pot-in-Pot). If you try this yummy Instant Pot recipe, drop me a line in the comments and let me know what you thought of it. I hope you enjoy this recipe! Instant Pot Picadillo is made with ground beef and lots of savory ingredients. 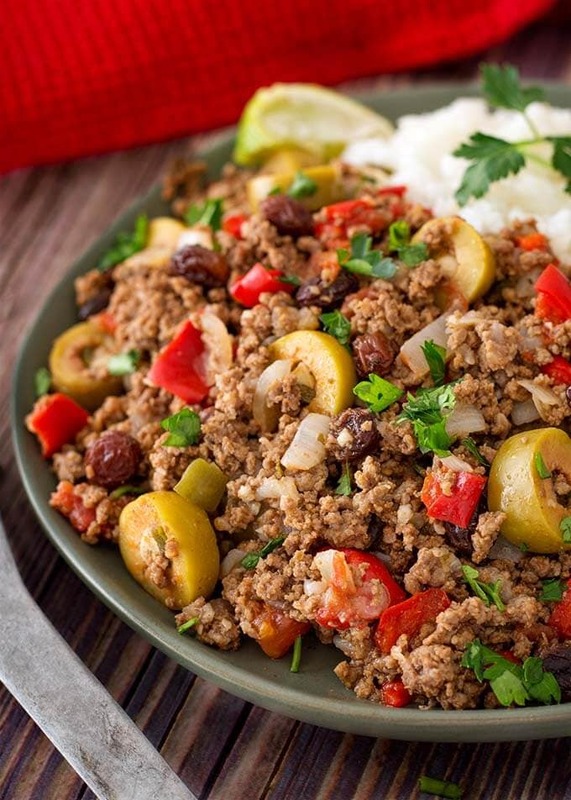 Picadillo makes a great taco, or empanada filling, and is delicious over rice, too! 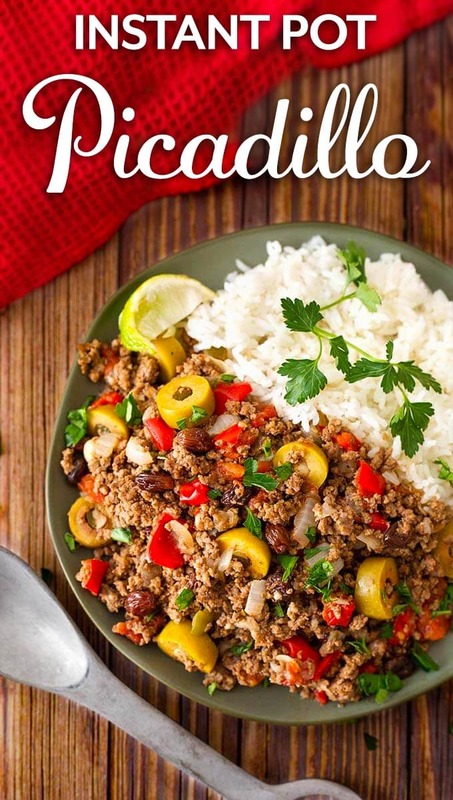 Make this pressure cooker Picadillo today! Turn on your pot's sauté setting. Add the ground beef and cook, stirring to break up the meat, until almost done (if using ground turkey, add 2 tsp olive oil to pot before adding turkey). Add the onion, bay leaves, cinnamon, cumin, and oregano, and salt. Cook, stirring occasionally, until onion starts to soften. Add garlic, jalapeño, and red bell pepper. Cook, stirring frequently, for a minute. Add green olives, olive juice, Worcestershire, and red wine vinegar. Stir together. Sprinkle raisins over the top, then pour the diced tomatoes evenly over the meat mixture. Do not stir. Cancel the Sauté function. Place the lid on the pot and lock it into position. Set the steam release knob to Sealing. Press the Pressure Cook/Manual button, or dial, and then the + or - to choose 7 minutes. High pressure. When the cook cycle ends, let the pot sit undisturbed for 5 minutes. Then Manually release the remaining steam/pressure until the pin in the lid drops down. Then open the lid and stir the picadillo. Serve over hot rice, or in tacos, burritos, etc.